You came highly recommended by my neighbor and they were correct. Your services were great and I will not hesitate to recommend your services to others. My unit was out, I called Schmidt Mechanical Group and a service tech was onsite within 2 hrs. Thank you for the prompt and professional service. I have seen your trucks in the neighborhood and saw your guys working on a house down the street so I decided to call. Thank you for the free quote on replacing my unit. You guys were priced more competitive than the other two quotes I received and I will be calling you at the end of winter so we can get my unit replaced. Thanks again! 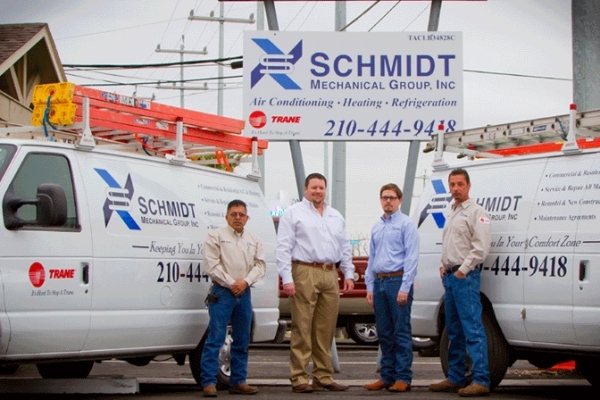 Schmidt Mechanical Group, Inc. was recommended by neighbors who purchased a system from them. Schmidt Mechanical Group, Inc. was the best contractor I have had in the last 40 years. I recommended them to another neighbor and they too purchased from them. Your service tech Curtis was so helpful and went beyond the call of duty!" Just a quick note to let you know how impressed I am with your service. I called you this morning expecting a several days' wait just for a technician to be free to make an estimate, but not only did you dispatch one within a couple of hours, but he also found and fixed the problem with my heater right there. I also appreciate his detailed and friendly explanation of what had gone wrong. You should give Ruben P. a raise! I will definitely call Schmidt Mechanical Group again in the future.